Yep, I've gone and built another Sarpedon model for another Client of mine. Of course one of the first things I tell someone when they ask for something that I've already built is that I will not build the exact same thing. It can be very similar, but not the exact same thing. In this case, that was not a problem and I was given free run on some areas of the model. You can see the amount of detail in his psychic hood above. Since building the first one, my skills have improved over time and I am able to get more detail into smaller areas that I just wasn't able to do a year ago. Goes to show you that if you keep at something, you can improve. The metal power cables come from Dragon Forge Design. I went over my thoughts on them a while ago. I decided to give them a go on this model instead of sculpting them to see how they would hold up. I do like that I was able to use two different sizes of cables and have them be consistent. Trying to sculpt the different sized cables would have been problematic to say the least. This model is based on the same leg conversion as the previous one. It put's him on a 60mm base which can be quite large considering he is only a character model, but I've found it to be the perfect fit for this guy. 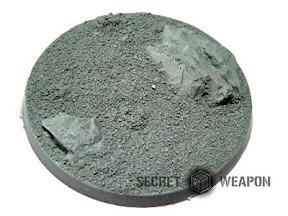 This base comes from Secret Weapon minis (the Desert Wasteland series) and was a spot on match for my Client's basing theme. If you look closely at the pic above, you can see a new element added to this one that was not on the previous one. That's the addition of hip plates. Where I sculpted them (only a rear one) on the first one, I used a Terminator waist plate for the back portion and cut plasticard for the sides on this guy. This guy is hard to attach to any kind of base really because you've only got 6 tiny points touching the base. There is nothing substantial in contact with the base that you can glue that will give you a good, solid contact point. Add to that the theme of the base is more open and uncluttered and there is nothing to "attach" the model to. With some careful positioning, I was bale to get a leg into position and hide the pin holding it in place. I try and get at least three points of contact so this guy will hold up to regular game play and the owner doesn't have to worry when using him in games. But it's the Soulspear that seems to draw the most attention and have the most problems. Here's where I was given free run on the model. Since I know nothing about the Soul Drinkers, I started doing some research about his weapon. You know, how it came about, where it came from, etc... anything I could find on it really. From what I could find, I discovered this is a very old artifact that was gifted to the Soul Drinkers by the Imperial Fists. That meant I wanted it to have a Pre-Heresy feel to it however that was going to work. It's so rare and powerful that the Adeptus Mechanicus "borrowed" it... forever. 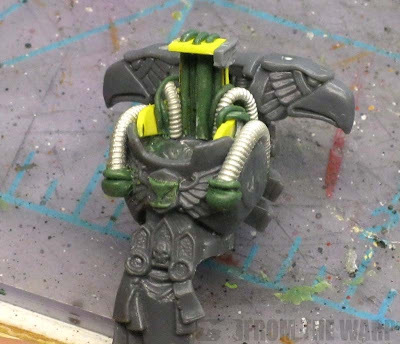 That gave me the idea to make it look like a Necron Lord weapon. Put those two ideas together and this is what I come up with. It's definitely a collection of bits. But I think I was able to pull it off and make a single weapon (artifact) that looks like something you might find in an Imperial force. It took me forever to build this thing too. I can't begin to tell you how many different blade combination and setups I went through. looks nice Ron :) except the soul spear didnt have any physical blades as such, it was more like darth mauls double ended lightsabre, but replace the lighty bits with pure black beams of warp gateway type sorta energy stuff. Nicely done. I'm always impressed by how much you get done at this quality level. Everything seems to fit very well with this guy. Why don't you try digging some holes in the base for the legs to sit in- that should increase the surface area for the glue. I mean the guy is hundreds of pounds and walking on sand- it's going to sink in a bit. If one of the talons is on a rock, you could have some cracks webbing away from it to give the sensation of weight. I have a strong feeling that when finished this will look exactly how I picture Sarpedon looking in my minds eye. Really like how it's looking so far. Have you considered getting a TubeTool from masq-mini.com, very expensive but it makes cables and tubes an absolute piece of cake. Ben: Hmmmm... that could be tough to model. 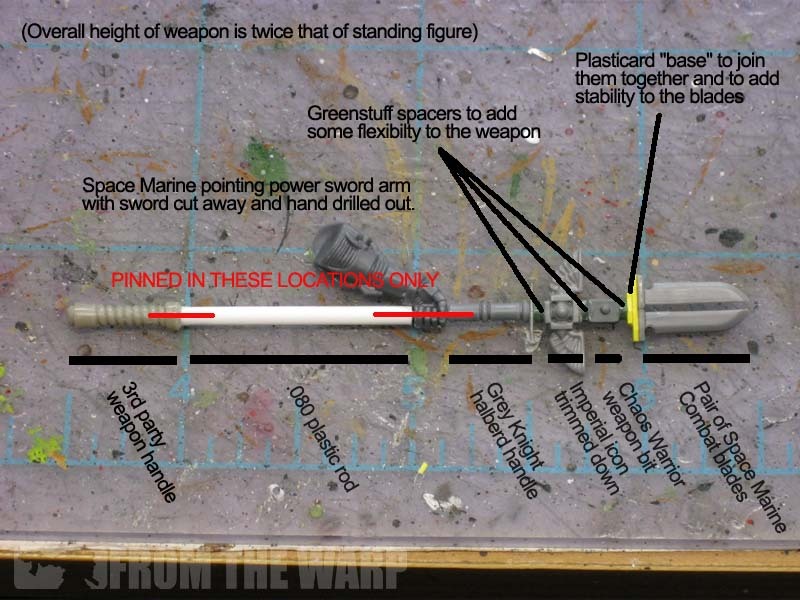 I sort of expected there to be different versions of the spear as GW can do that sometimes. Even with the most simple of things you can end with a bunch of different versions as it were. I'm glad you like him in the end though. I think of him as maybe just one "interpretation" of the model and certainly not the definitive one. Mike: Thanks, it took some time to get him together though, I'm not gonna lie. I had the benefit of building one before to go from this time. Reid: What a great idea, I never thought of that. I'm keeping it for next time though for sure. Lamenter: Never even heard of it. I'll have to check it out if it works as well as you say. Love the spear. I now want to try something like that if I get the chance. VonWalther: Thanks, but it's only one interpretation of something that has so many different impressions. It's a weapon that I suspect most die hard Soul Drinker players have very strong feelings about how it should look. Those kinds of things can be tough to do well enough to please most folks. Ben: Like everything else out there, there was enough information to give me an idea, but not enough to pin it down to something in particular. The pieces look great, Ron. 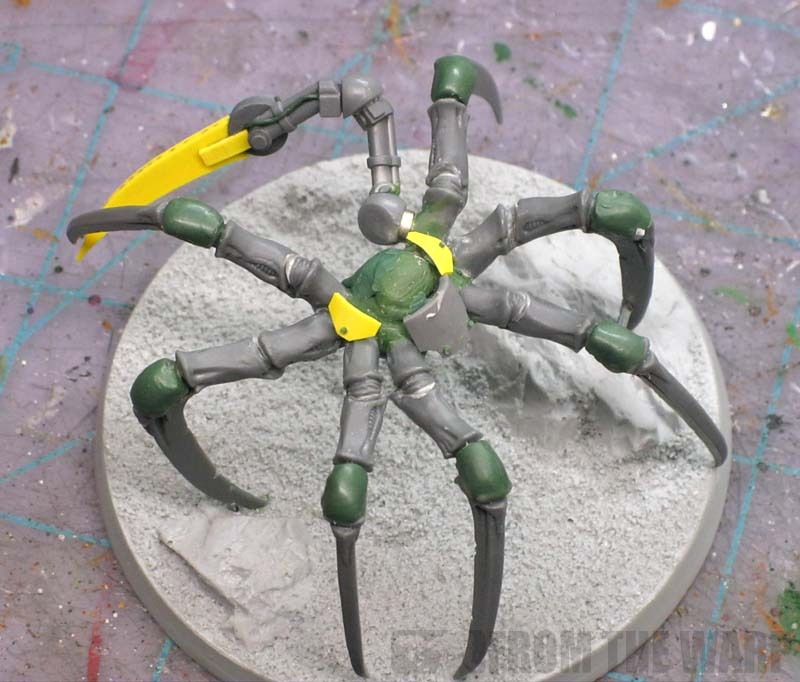 I'm curious how you go about making the green stuff rivets. 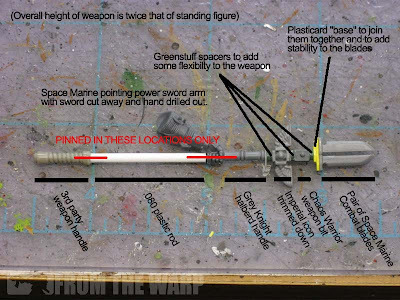 Also, there is some details on the soul spear in last chapters of the Phalanx by Ben Counter.